Welcome to the Java Relief stories site where we talk about our passion of helping children at risk worldwide. Wake Up Do Good! Limited Edition, organically grown Haitian coffee. We have 200 pounds of the rare single origin coffee. Hurry before it's all gone! We have exciting news for you! We've partnered with small coffee farms and a micro-plantation in the mountains of Haiti. We're roasting these single origin, organically grown, arabica coffee beans and are ready to send them to you! Haiti is the most mountainous country in the Caribbean which makes it an ideal place to grow coffee trees. 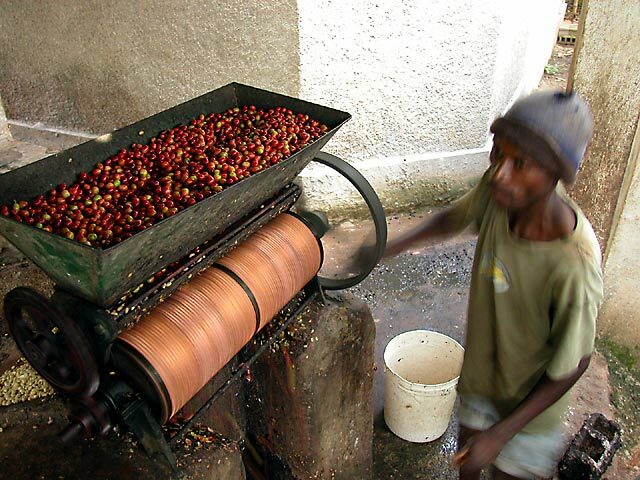 In fact, coffee had long been the backbone of Haiti’s economy. As recently as 1949, Haiti was the world’s third major producer of coffee. But a brutal dictatorship, a US coffee embargo (which led Haitians to burn coffee trees for charcoal - something most still use for cooking today), natural disasters, and worldwide oversupply caused a steady decline and Haiti now produces less than 1% of the world’s coffee. From the beginning, we at Java Relief have wanted to offer coffee from Haiti. With a connection from EcoCafé Haiti, we found that could be possible. Last January, our family flew to Haiti to visit the children in the orphanages and Cité Soleil but also to find a quality bean. With our amazing friend Luken, as our driver and translator, we rented a 4-wheel drive and started off on what would be a true adventure on dirt roads, through river beds and up steep mountainsides until we arrived in the quiet, beautiful, mountain village of Ranquitte. With limited electricity, dirt roads, donkeys, a few motorcycles and even fewer vehicles for transportation, it was a step back in time. We spent some time at the covered, but open-air coffee “plant”, meeting some of the employees of EcoCafé. Really, some of the kindest men you could meet! They told us about the jobs they each do and showed us around. Afterward, we hiked further up the mountain to the coffee farms. These farmers have coffee trees that grow on their property, mixed in with all the other trees and vegetation. The farmers hand-pick from each tree on their property and carry the beans down to the coffee plant. It is truly a grass-roots operation and so clearly benefits the small farmer. The biggest need in Haiti is job creation! We felt God's blessing to have been able to visit EcoCafé Haiti and Ranquitte. And even more blessed to help the Haitian coffee farmers by selling their organically grown, arabica coffee beans! Thank you Java Relief donors and coffee drinkers. Together we are giving hope to coffee farmers in the mountains of Ranquitte, Haiti!